Here’s a sneaky peek at some of my photographs being prepared to be exhibited at the Oasis Cafe at Stepping Hill Hospital in Stockport. Money raised from the sale of my work goes to the Mental Health Unit at Stepping Hill, a little bit goes to Arc, (the charity who I volunteer for, and who organised this), and some to me! Yay! Ultimately, the real objective is to make people happy. Make people feel positive and inspired. And to raise awareness of Arc’s many wonderful programmes and services for mental wellbeing. I’m going to pop in to Arc tomorrow, so I can get dimensions for you then. But, they’re roughly A3 in size. Two are larger and in a square format. Send me a message in the box below, or email me at: thereisnocavalry@icloud.com if you’re interested. White Scar, near Hawes, North Yorkshire. Dry-stone wall, Grassington, North Yorkshire. “Wuthering Heights”, Haworth Moor, West Yorkshire. 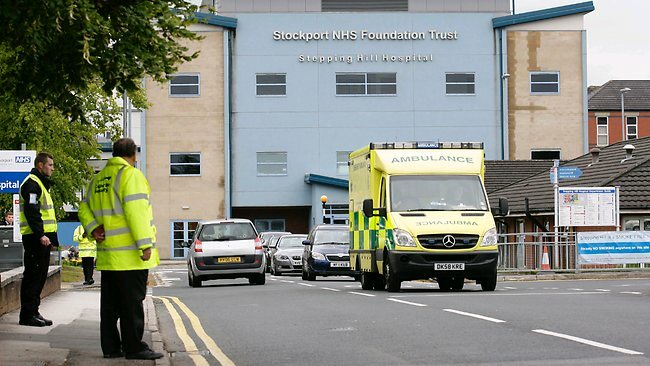 Stepping Hill Hospital, in Stockport, is my local hospital and has come in for quite a bit of stick of late due to 5 patients dying as a result of saline contaminated with insulin. I’m not going to discuss that here as it’s had its fair share of media coverage. The NHS in general comes in for a lot of criticism. Invariably, people don’t feel compelled to write in when they have something good to say. So, the time has come to put inertia to bed. Both of my daughters were born at Stepping Hill Hospital and the care my (ex) wife and my babies received was exceptional. For that alone, I am truly grateful. But, I too, have had call to frequent the wards of SH as a patient having had three operations there. The first was a cholecystectomy. (That’s having your gall bladder removed to you and me.) I recall tossing and turning on my bed at home at about 4 in the morning, letting out a low incessant groan due to a pain in the right hand side of my chest. I called NHS Direct and they promptly sent an ambulance round. I’m sure the ambulance crew were very grateful for me throwing up in their rig upon immediate entry. Once at the hospital, an Irish doctor asked me, on a scale of 1 to 10 how much pain I was in. Being a Yorkshireman, and of sturdier stuff than most, I whimpered – 11. This kindly Irish doctor promptly administered some morphine intravenously. Within 30 seconds I was babbling away like I’d kissed the Blarney Stone. I was taken up to a ward and, later that day, tested for a heart attack. (Yes, you can get pain on the right hand side of the chest with a heart attack.) In the afternoon, a surgeon made an appearance and asked me a couple of questions, felt under my ribs front and back and promptly berated the junior doctor for theorizing that it might’ve been a heart attack and prognosed cholecystitis. Suffice it to say, less than 3 months later I had it all whipped out with keyhole surgery. Top job all round, for care and treatment. I do miss that morphine though. Next up, was for corrective surgery on a broken pinky that Trafford General made a right balls up of. I broke it whilst playing five-a-side footy. Thankfully, they have a specialist hand surgery department at Stepping Hill and they made a very tidy job of straightening my finger and enabling me to bend it once again. Last of all, was carpal tunnel surgery. They discovered I had this while I was being treated for my broken pinky. Carpal Tunnel Syndrome is when a nerve that travels through a sheath in your wrist and connects to your thumb and fingers, becomes trapped, resulting in loss of feeling in said fingers. I was in and out in less than a brace of hours. Tidy darts all round. On the downside, my wrist was out of action for two weeks. Man, that was a long two weeks. And, do you know what? It’s all for Free! Gawd bless the NHS. So, a very big thank you, Stepping Hill, you are all superstars. And, for delivering my two precious babies into this world, I am eternally grateful.